The Ancient Maya writing system could express anything that could be said in spoken language. Like ancient Egyptian hieroglyphs and modern Japanese characters, it had signs for both simple sounds and whole words. Maya writing combined logographs (symbols representing whole words) with symbols that represented phonetic syllables (for example: ma, me, mi, mo, mu). The word jaguar (bahlam), for example, could be written as a symbol which looks like a jaguar’s head, or as a cluster of three syllables: ba-la-m(a). 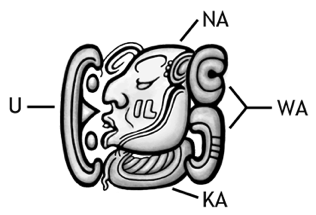 In slylabic systems like Mayan the final vowel (in this case the “a”) is often silent. There were over 600 logographs but, for reasons of style, the scribes often preferred to use syllabic writing. 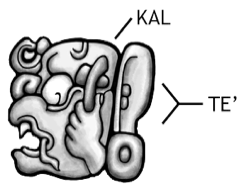 While the Mayan language had 100 phonetic syllables, there were as many as 200 symbols to represent these sounds. So, for most syllable sounds, there was a range of symbol choices. In an extraordinary mingling of language and art, the Maya scribes selected the glyphs that best fulfilled their aesthetic sense. The more frequently a word was used, the greater the variation seen in writing it, as the Maya didn’t like to repeat a spelling or design within the same block of text. The symbols below are all possible versions of the sound “ma”. In syllabic writing, the symbols representing consonant/vowel pairs or vowels were arranged in glyph blocks to sound out each word. 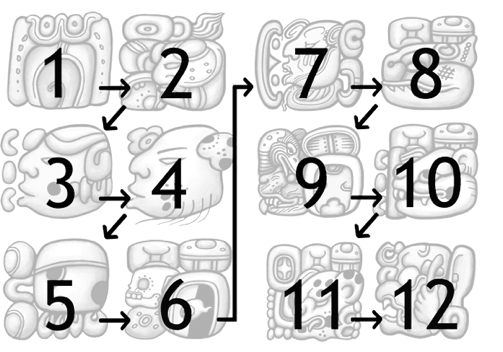 In each glyph block the symbols were generally read from top to bottom and from left to right. Here are just a few of the many combinations possible. Cracking the Maya Code: clips of PBS NOVA’s excellent film about deciphering the Maya glyphs. 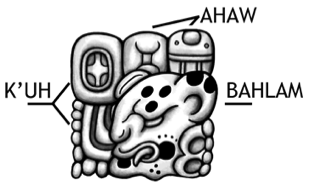 Omniglot: overview of Maya glyph writing with Maya syllabary and links to a range of Maya sites. The Maya Hieroglyphic Codices: An advanced site with a searchable database of the four codices with translation and analysis. 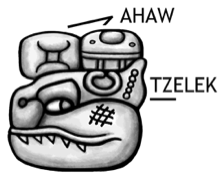 It means "Lord 6 Dog, Holy Lord of the Jaguar Kingdom - the Kalomte', battled against Lord Tzelek his younger brother". 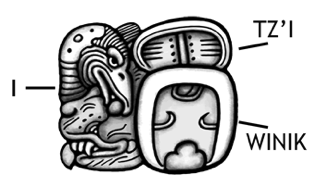 In Maya writing, sentence structure is different than in English so the glyphs actually go in this order: He battled Lord Tzelek the younger brother, Lord 6-Dog - Divine Lord of the Jaguar Kingdom and Kaloomte'. The glyphs are written with a combination of logograms and phonetic symbols. Each component is identified below. 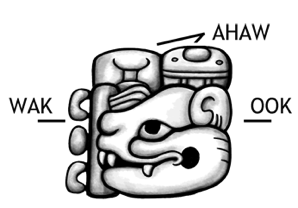 You'll find the following sentence written in Maya glyphs, in the Jaguar Stones books. In short inscriptions the glyph blocks were arranged horizontally or vertically in single line sentences. In longer texts the glyph blocks were often placed into a grid much like a chessboard. The glyph blocks were then read from top to bottom and left to right in paired colomns (see example below).